Bygone Glamour | Where scholarly research gets cozy with hands-on historical costuming, vintage style, and antiquated domesticity. Just a quick update to announce that I’ve gone through my Annotated Bibliography to add 13 more entries (bringing it up to a count of 107!) and to add quick annotations to all of the entries on the main page. Now, on the main page, each entry has the basic citation and also a brief note about whether the book is recommended, recommended for the pictures, recommended only if there’s nothing else available, or not recommended. The negative notes generally contain a bit of extra information about why I don’t think the book is worth looking at. There are a lot of recommended books on the list – because there are a lot of great books on historical costume out there – but hopefully my Annotated Bibliography can be some help in determining which books fit a given subject and are worth tracking down. Most of the recommended books have more detailed annotations included in linked posts of their own, for more details on content and usage. For my own purposes, I find the A.B. useful when I’m researching a new period or a specific topic, or when I have a bit of extra cash and want to figure out what book to buy next. Sadly, some of the books I desperately wish to acquire – especially those by Norah Waugh – are consistently very expensive, and out of my price range. Someday! In the meantime, that is what libraries are for. If you’d like to see the updates and peruse the reviews, visit the Annotated Bibliography page. So I’m on a mission to get a bunch of tees wrangled all at once. Since I’ve already had success with the Blank Canvas Tee free pattern by Steph of 3 Hours Past the Edge of Tomorrow, I’m going to start with various iterations of that pattern (before I attempt the Sewaholic Renfrew or a couple of designs I’d like to draft/drape myself). I already have a copy printed out and taped together and successfully used, but Steph has since updated the pattern, changing to a jewel-neck instead of a slight scoop, which is easier for drafting variations. So I’ll print off a new copy and wrangle the pieces again, adding some length at the hem like before, and also the same amount of length in the bust that I did before – an extra inch and a half to accomodate The Bosom. That extra length allows the shirt hem to hang to an even length, with the shoulder seams actually sitting on top of my shoulders. With RTW tees, I have to yank them forward if I want to hem to sit evenly – bleh. This time, I’ll also play with changing the back to get a relatively snug fit without having the side seams shift toward the front. On my existing flutter-sleeve BCT, I ended up with a looser fit than I was looking for, but the front didn’t want anything removed, so I makeshifted a fix by taking in the center back and creating a seam there. I’ll need to play around the the adjustments, but I think I’ll take fabric out of the center back – since I don’t want to mess with the sides on the front, I’d rather not fiddle with the sides of the back too much and risk skewing things. The plan is to get the fit right on a plain, basic Blank Canvas Tee, then once that’s set I’ll draft up all the versions I (currently) have plans to make. 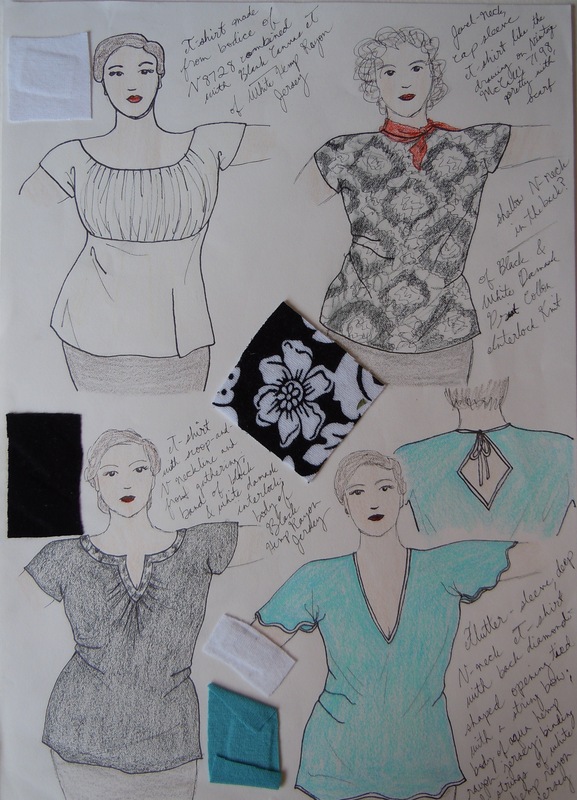 I’ve drawn up a small flock of tee designs on a set of croquis (blank, simple figure drawings to trace and design on) I drew based on photographs I had Zachary take of me, in which I wore a snug camisole and leggings (shudder), so I could design on my actual (iiiif slightly smoothed out) shape. It really helps with the design process, and I can’t comprehend why it’s standard practice to design clothes on an extremely elongated, super-skinnified figure – I took fashion drawing some years back, and the teacher loathed me for my impatience with that convention. Wouldn’t it make more sense to design on a body with a shape like an actual human? 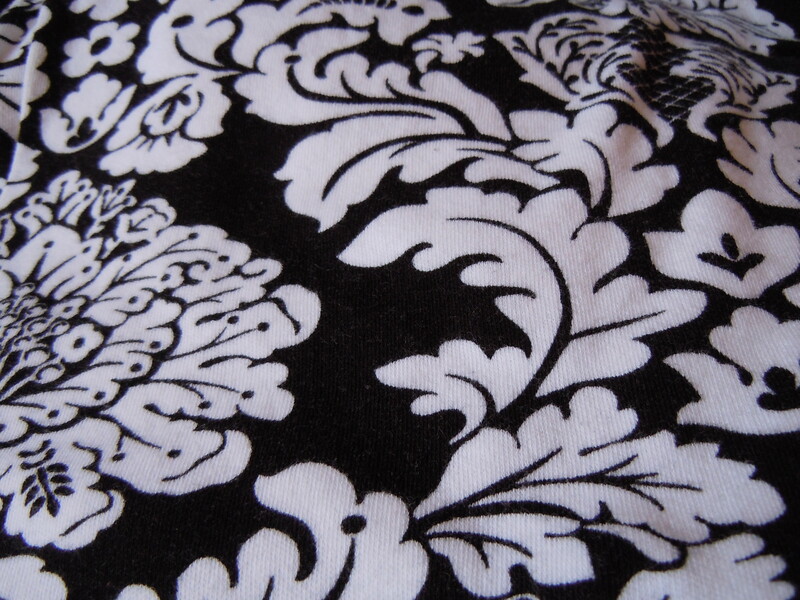 The first design is for a black-and-white damask print cotton interlock knit. It’s not as stretchy as jersey, but it’s stretchy enough that I think it ought to make a nice tee, as long as I keep an eye on the fit along the way. The print is large and bold, so I’m keeping the design very simple – a Blank Canvas Tee with a jewel neck, possibly dipping to a shallow V in the back (to be interesting and to accommodate the limited stretch of the interlock). 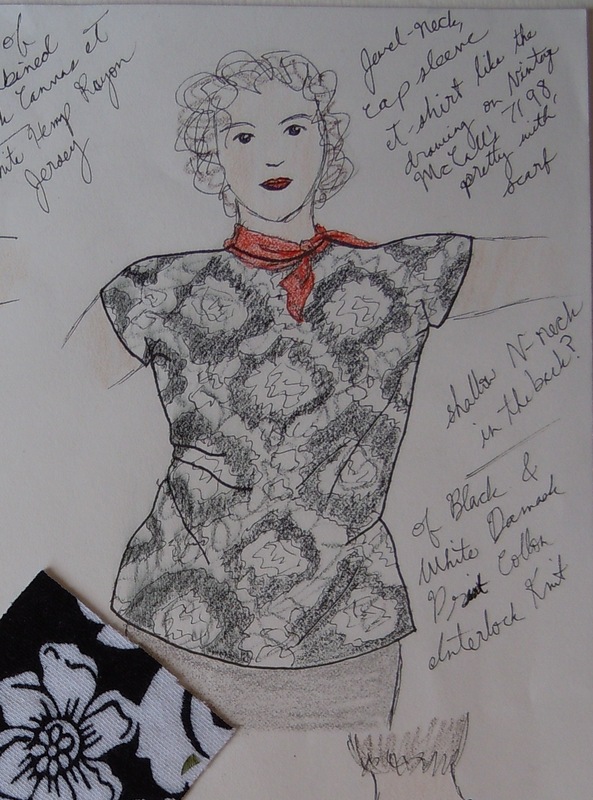 I was inspired by a blouse on the cover of a vintage pattern I have, which softens the rather severe neckline with a scarf. Next up: RED! This BCT will have a sweetheart neckline, and I’ll bind the neck and armhole edges, probably with contrast fabric. The plan is to do black contrast binding, but I’m not 100% sure – I’ll have to play with it to make sure it doesn’t look like a bit too much. I like bold, but I’m not sure I want to be blinding! I love Steph’s flutter sleeve, V-neck hack for the Blank Canvas Tee, so that’s the version I made some months back out of coral-orange cotton jersey. Can’t have enough flutter sleeves, and I think they’ll look especially nice in the fine, almost tissue-weight hemp rayon jersey, so I’m going to do an aqua version. Then, for novelty, I’m going to draft in a diamond-shaped cut-out in the back, and have the tee tie above that. 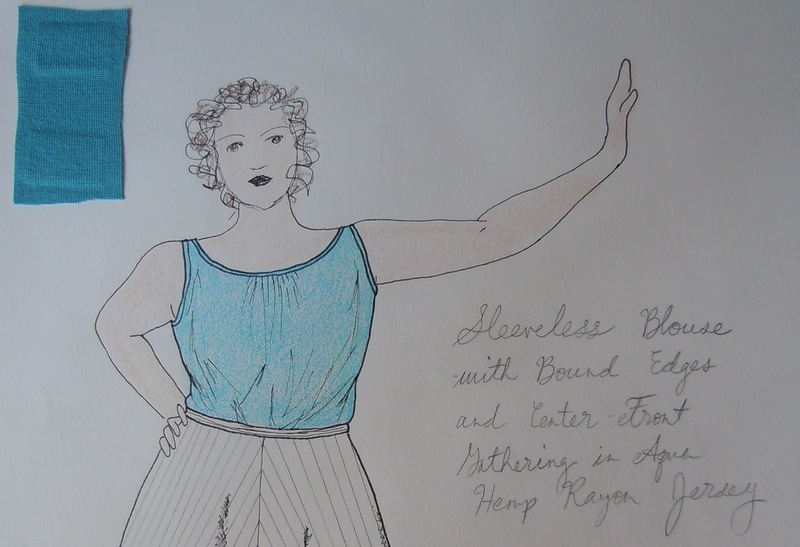 When I drew this out, I planned to bind all of the edges in white hemp rayon jersey, but now I’m not sure. It would be a lot of bother, and the hemp rayon doesn’t seem very inclined to ravel – my coral cotton is a looser knit and getting a bit wibbly at the edges. We’ll see. This neckline is based on one on a 3/4 sleeve tee I’ve had for years (and I actually used to have another in a second color as well), that’s quite bedraggled at this point and can no longer comfortably encompass the proportions of The Bosom, but I still love the neckline and I can easily copy it. The original has gathering around the V, which I may or may not reproduce, depending on the results of fiddling with things. The original has a band that’s trimmed with beads and sequins (it’s not as garish as it sounds), but I think I’ll do my neckline band out of my black-and-white damask print interlock. I like using bits of things for other things, and then it won’t need trimming. 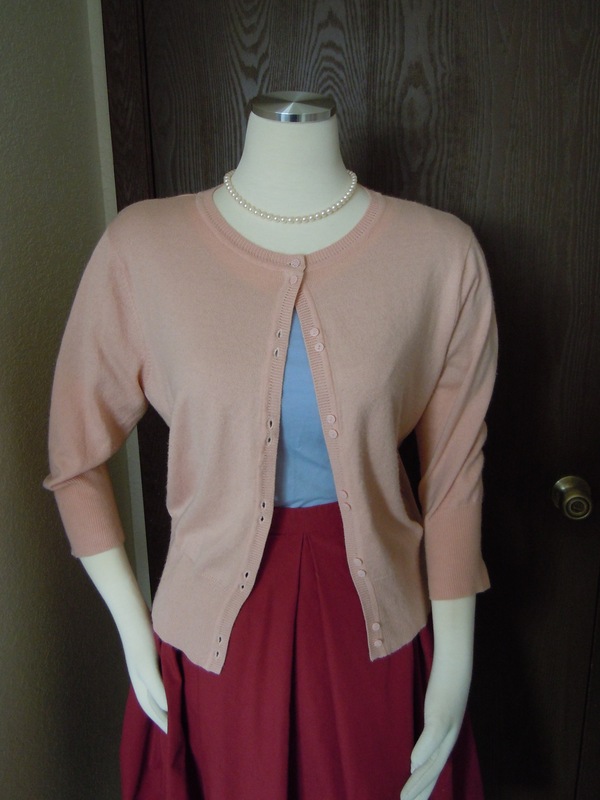 I am very fond of Vintage Vogue #8728, from 1946, and I was absolutely floored by Casey’s idea of making the pattern up in jersey instead of a woven – I’m planning to make a coral cotton jersey version of V8728, and I figure that while I’m at it, I might as well turn the bodice into a T-shirt pattern by combining it with my custom-fitted BCT pattern. I may use white organic cotton jersey instead of white hemp rayon jersey though, because the hemp rayon is really quite thin, and very thin white garments are a bit inconvenient. We shall see. 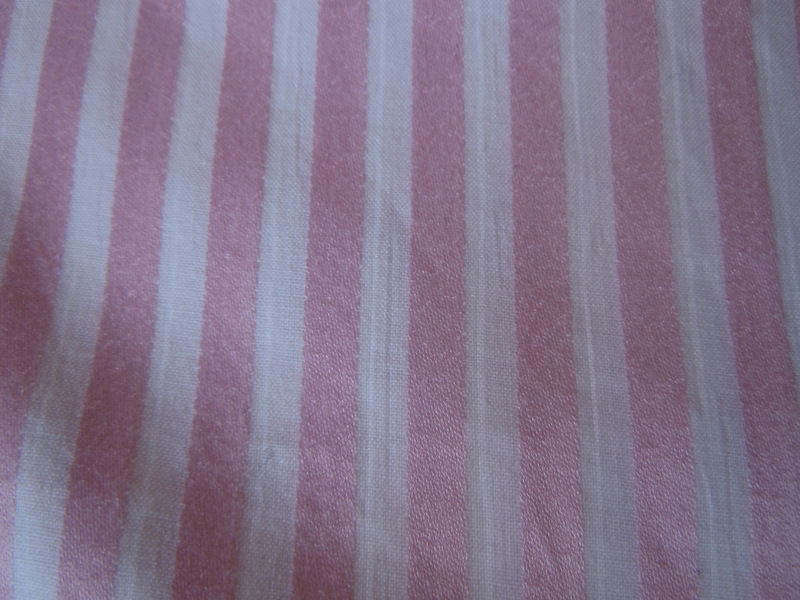 I have two ivory jersey layering tops of just this design, and I’ve nearly worn both of them to death. I’m planning to make a few replacements in various colors, using a combination of the existing shirt(s) and my BCT pattern. Like the originals, the neckline and armholes will be bound, and there will be a bit of gathering around the center front of the neckline – it really helps give enough room for The Bosom without adding bagginess around the upper chest. This design is based on something a snipped from a magazine – a recent fashion magazine, actually! I quite like it, but this project is probably a bit down the road. 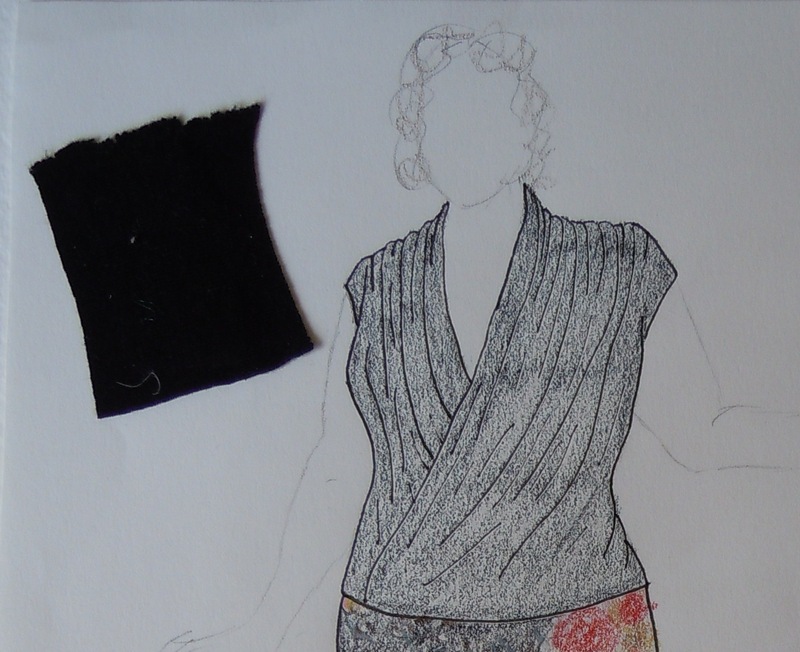 I’ll need to drape (or at least, partially drape) the front, which will require actually getting my dress form padded out to my dimensions (it is currently size teeny-tiny). Eventually, though! After I’ve wrangled some Blank Canvas Tees, I’ll tackle the Renfrew. It has actual separate sleeves so it won’t be quite as easy to fit or make, but it seems like a reasonable next step. There’s a 3/4 sleeve tee that Ivy wears in episode 12 of Smash that really caught my fancy, and I think I could draft it up using Renfrew as a base pretty easily. Eeeeeeeventually. First, however! Some Blank Canvas Tees. Okay, actually first – I spend longer wrangling pictures and writing this than I anticipated, so before printing and taping and cutting begins, I need to get something to eat. Mm, popcorn! So! 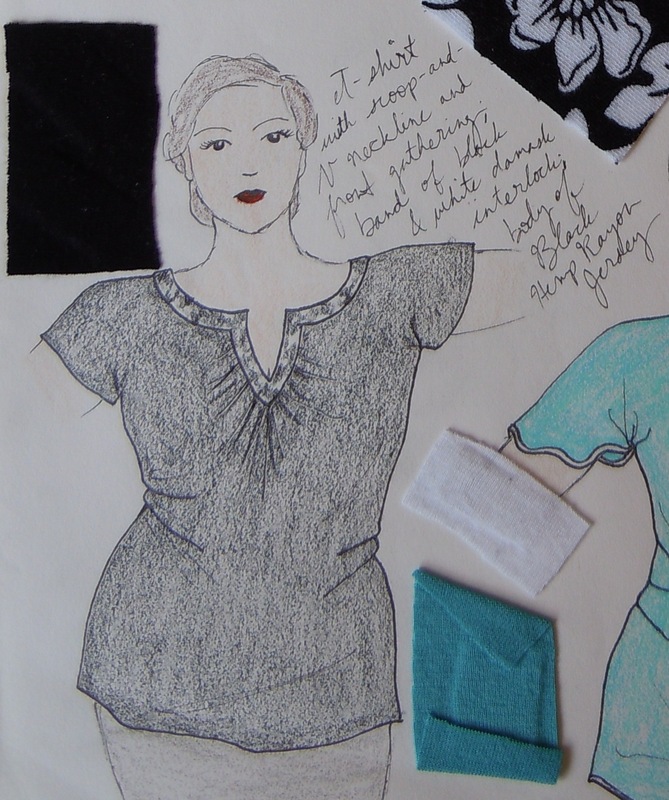 I never get around to doing as much with this blog as I intend, but I did just add a bunch of new stuff, because I registered for independent study hours over the summer, doing research on 1912 clothing. It had two components, a big paper and a shorter how-to article for people trying to put together passable 1912-ish clothes for living history (specifically related to a spring course and conference). 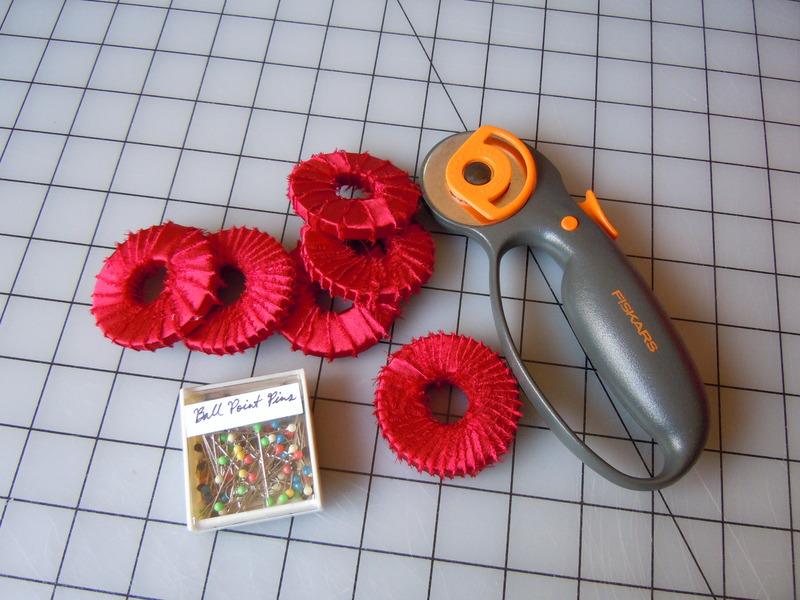 But I found so many fabulous resources online for the how-to side, and general visual resources, that I ended up doing the how-to component online here, with a little index and a set of posts full of links and summary information. There’s so much incredible information out there on the internet, but it can be shockingly difficult to track down the right stuff – thus why curating the internet, so to speak, is something of a hobby of mine. The plan is to keep adding links to the 1912 research section, as I find them, and now I’m also thinking of doing something similar for other periods. I have a truly massive collection of bookmarks, and I always wish it was easier to find good sewing and costuming resources, so I think I’ll see what I can do to improve matters. I suspect that keeping my various sewing and costuming resources organized in this form will even make them easier for me to use. …maybe at some point I’ll even put up pictures of the projects I’ve finished? Hopefully I’ll be able to do more sewing and more blogging about it! And then I won’t forget how I did things after they’re done. Maybe. But at least there are 1912 resources, tidily organized! 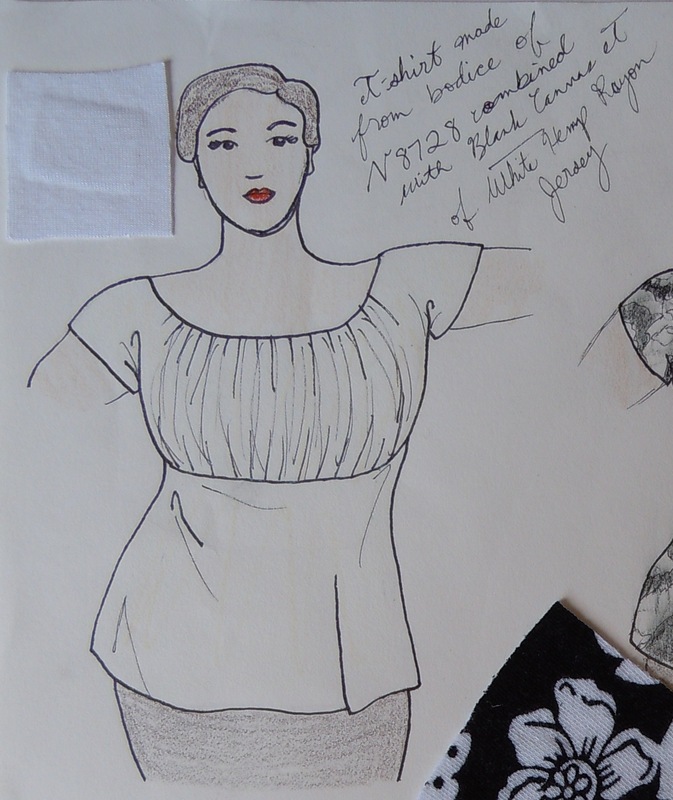 Sewing Dresses from the Teens Era by Bridget Conlogue, an article at the website of the Greater Bay Area Costumers Guild (GBACG). 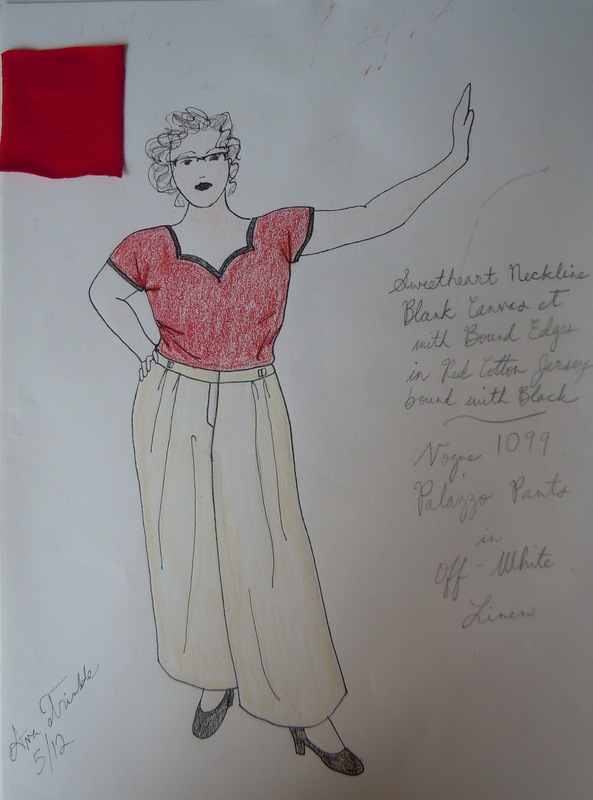 Titanic Fever: 1912 Garment Construction Resources by Natalie at A Frolic through Time, an article with links to and reviews of various research and construction resources. Patterns for a 1911 Wardrobe Online by Natalie at A Frolic through Time, an article introducing various digitized primary sources and discussing their usefulness and content. Sifting Through Endless Edwardian Patterns by Jennifer Rosbrugh at HistoricalSewing.com, an article listing and reviewing various 1900s and 1910s patterns available commercially, as well as some available for free online. 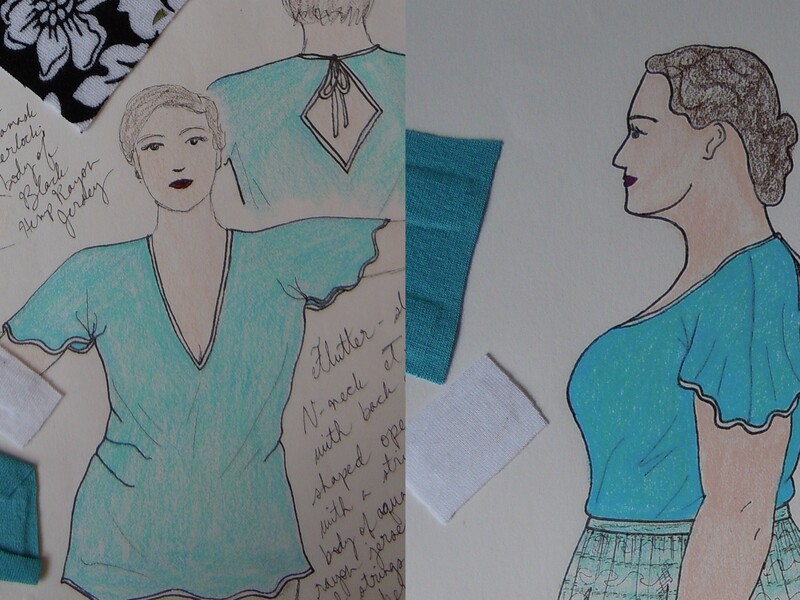 If I Were To Make This Titanic Tea Dress, Here’s How I’d Do It by Natalie at A Frolic through Time. An extremely detailed breakdown analyzing an extant gown and articulating the process she would go through to reproduce it. Very helpful. Practical Help for Inexperienced Sewers, 1907 by Lauren at Wearing History, an article with excerpts and images from a 1907 Butterick sewing pamphlet, with helpful commentary. The American System of Dressmaking (1912) by Pearl Merwin, a digitized primary source book, available free for download at the Internet Archive. The Dressmaker (1911) by the Butterick Publishing Company, a digitized primary source book, available free for download at the Internet Archive. Dressmaker’s Dictionary (1916) by Home S. Curtis, a digitized primary source book, available free for download at the Internet Archive. The secret of successful tailoring (1910) by Edward Watkins, a digitized primary source book, available free for download at the Internet Archive. On women’s tailoring. New teacher of ladies’ home tailoring (1910) by George Hurwitz, a digitized primary source book, available free for download at the Internet Archive. On women’s tailoring. The Alfred Scott system of actual measure of coat and vest (1906) by Philip Colavita, a digitized primary source book, available free for download at the Internet Archive. The American garment cutter (1908) by Samuel Regal, a digitized primary source book, available free for download at the Internet Archive. See also the 1914 edition of the same book. The Copeland method; a complete manual for cleaning, repairing, altering and pressing all kinds of garments for men and women, at home or for business .. (1908) by Vanness Copeland, a digitized primary source book, available free for download at the Internet Archive. Ratner’s up-to-date method of designing; school of designing, cutting, grading and fitting, for ladies’, gentlemen’s and children’s garments, ready made and order made, also dressmaking and furs .. (1908) by Henry Wolf Ratner, a digitized primary source book, available free for download at the Internet Archive. Certainly, clothing was different in New Mexico; clothing everywhere was subject to regional variation, especially in places with substantial cultural intersections. But in the course of my research, I found that clothing in New Mexico around 1912 was not as markedly different from clothing elsewhere in the United States than I had expected. In the local photographs and newspaper advertisements I surveyed, New Mexican men are often seen wearing three-piece suits, though working men sometimes lack a jacket, and can sometimes be seen without waistcoats as well (though this was considered somewhat indecent). 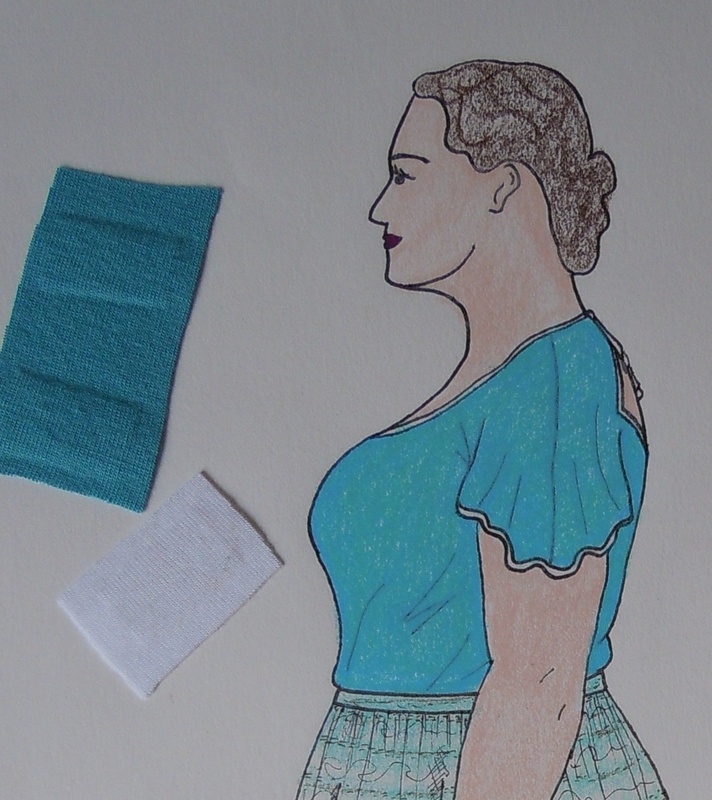 Likewise, New Mexican women are typically seen in dresses and separates like those worn elsewhere in the United States. Both sexes seem to have kept up with east coast fashions to whatever degree they could afford it, with simpler and less modish clothing for people with low incomes. There’s a common belief that women in the West “must” have worn corsets less than women in cities back east, because it was too hot, and corsets were not practical. But in my experience, for women of a, shall we say, buxom variety, it can actually be more comfortable to wear a corset, with evenly distributed bottom-up support, rather than a modern bra, with support coming in from straps which hang from the shoulders and a narrow band around the chest. Historically, corsetry is not synonymous with tight-lacing, and it need not be painful, dangerous, or even particularly uncomfortable. I have personally worn a corset while in the heat working outside, and it made very little difference, as long as it was made of natural fibers (which breathe), fit well, and was laced properly, not too tight or too loose. So, Western women could have worn corsets. Did they? My survey of early twentieth century photographs of people in New Mexico and the Southwest indicates that corsets were worn with roughly the same incidence in this region as elsewhere in the United States. Which is to say, they were worn by most women, most of the time, with the exception of some elderly women, some very poor women, and women otherwise socio-culturally outside of any concerns about Euro-American fashion. In the latter category, photographs of Native Americans taken in the early twentieth century often show people in what appears to be the traditional dress of their people, or, in some cases, a romanticized version of traditional dress; unsurprisingly, in these images, none appear to be wearing corsets. But among Euro-American and Hispanic women, the corset appears to have been as common in New Mexico as anywhere else. This is not to say that clothing in New Mexico was the same as anywhere else – regional variations played a role, more so than they do today, even. Regional variations are particularly marked among the lower rungs of society; unfortunately, these are also consistently the least documented parts of society. It is difficult to find pictures of working class people, subsistence farmers, and the like, especially pictures in their everyday working clothes rather than their Sunday best. Because of the comparative scarcity of such images, it’s difficult to make a broad analysis – the sample size is too small. Hopefully, I will be able to increase my pool of study material and do further research on this subject. As a general framework, though, my research so far indicates that it is reasonable to assume that clothing in New Mexico circa 1912 was, for many people, much like clothing in the rest of the United States, particularly among the upper and middle classes of both Anglo-American and Hispanic descent. 1912 Project: New Mexico, a Pinterest Board of mine, with a collection of images and links. Chronicling America: Historic American Newspapers, hosted by the Library of Congress. Archives Photographic Collections at the Rio Grande Historical Collections, New Mexico State University. Albuquerque citizen., May 29, 1908, Page PAGE TWO, Image 2, a page from a primary source newspaper at Chronicling America: Historic American Newspapers, hosted by the Library of Congress. Women’s clothing. Albuquerque citizen., February 05, 1908, Page PAGE THREE, Image 3, another newspaper page at Chronicling America. Women’s clothing. Carrizozo news., December 02, 1910, Image 5, another newspaper page at Chronicling America. Women’s clothing. Carrizozo news., September 08, 1911, Image 11, another newspaper page at Chronicling America. Women’s and girls’ clothing. Carrizozo news., September 29, 1911, Image 11, another newspaper page at Chronicling America. Women’s clothing. Carrizozo news., October 13, 1911, Image 10, another newspaper page at Chronicling America. Women’s clothing. Carrizozo news., October 27, 1911, Image 9, another newspaper page at Chronicling America. Women’s clothing. Carrizozo news., January 19, 1912, Image 9, another newspaper page at Chronicling America. Women’s clothing. Albuquerque citizen., April 19, 1909, Page PAGE SIX, Image 6, another newspaper page at Chronicling America. Women’s high fashion catalog advertisement, no illustration. Albuquerque citizen., February 23, 1909, Page PAGE SIX, Image 6, another newspaper page at Chronicling America. Women’s clothing. Albuquerque citizen., August 15, 1908, Page PAGE THREE, Image 3, Men’s and Boys’ clothing. The Tucumcari news and Tucumcari times., March 28, 1908, Image 17, another newspaper page at Chronicling America. Men’s clothing. The Tucumcari news and Tucumcari times., October 31, 1908, Image 5, Men’s clothing. Albuquerque citizen., July 31, 1909, Page PAGE SIX, Image 6, another newspaper page at Chronicling America. Men’s and boys’ clothing. Carrizozo news., October 01, 1909, Image 6, another newspaper page at Chronicling America. Men’s clothing. The Tucumcari news and Tucumcari times., October 16, 1909, Image 12, another newspaper page at Chronicling America. Men’s clothing and a women’s corset. The Tucumcari news and Tucumcari times., April 04, 1908, Image 24, another newspaper page at Chronicling America. Men’s clothing. Carrizozo news., October 20, 1911, Image 10, another newspaper page at Chronicling America. Men’s clothing. Albuquerque citizen., February 13, 1908, Page PAGE EIGHT, Image 8, another newspaper page at Chronicling America. Men’s clothing. 1912 Project: New Mexico, a Pinterest Board of mine, with a collection of images and links, including many of people who appear to be of Hispanic descent and of people known to be of Hispanic descent (such as photographs of the Amador family of Las Cruces). Native American Portraits: Points of Inquiry, an online exhibit at the Palace of the Governors. 1912 Project: NM Native Americans, a Pinterest Board of mine, with a collection of images and links. Fashioning New Mexico, an online exhibit about clothing, at the Palace of the Governors.